With the qualifying rounds of the Cup moving closer to their end, the 2nd Round Qualifying draw pit potential giant-killers against famed giant-killers of the past. 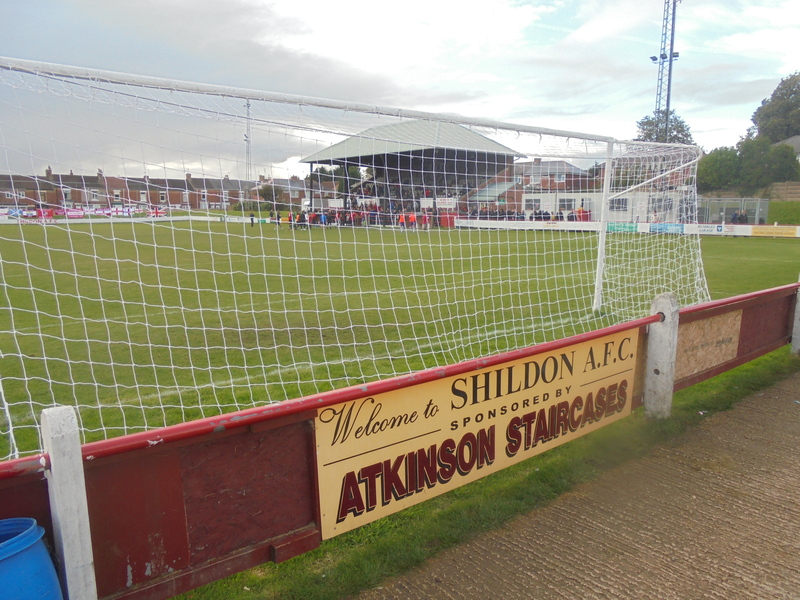 Shildon play in what is arguably the strongest Step 5 league around, the Northern League, and therefore aren’t quite as far away from those clubs a division or so higher. As such Altrincham – who are well known for their cup exploits in upsetting higher league outfits – would need to be on guard to avoid becoming the Goliath to Shildon’s “David”. My journey began by jumping on the Altrincham supporters’ coach in nearby Sale at just before 10am, before heading on past the Robins’ Moss Lane ground. After a couple of further pick-ups, we were well and truly en-route to the North East. Following a very uneventful initial part of the journey, we soon pulled into Wetherby services which was full of other fans (especially those of QPR in their vivid purple) heading here and there. 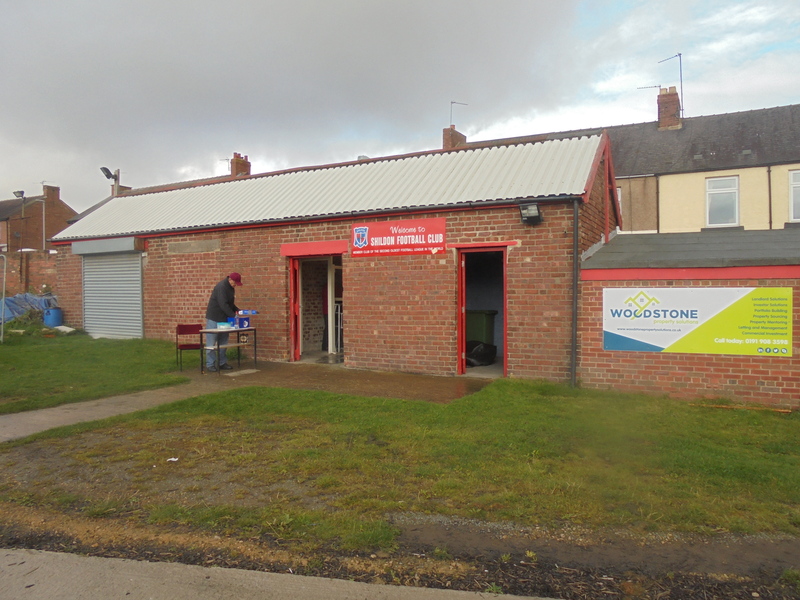 As for us, a short stop off was had here, though it did afford the chance to catch up with Alty fans Jonny and Danny, who were also on the bus but, due to its fullness, weren’t too close to myself. After a brag from Jonny about them getting the journey for free (contacts and that), we were back on the road. It’s all right for some!! A further hour-and-a-bit’s drive later and we were pulling within sight of Dean Street’s floodlights. Sadly, due to the late-ish arrival, my initial plans to go and have a look at the railway museum (which is free for anyone so inclined) and the visiting Flying Scotsman were now no longer on the table. 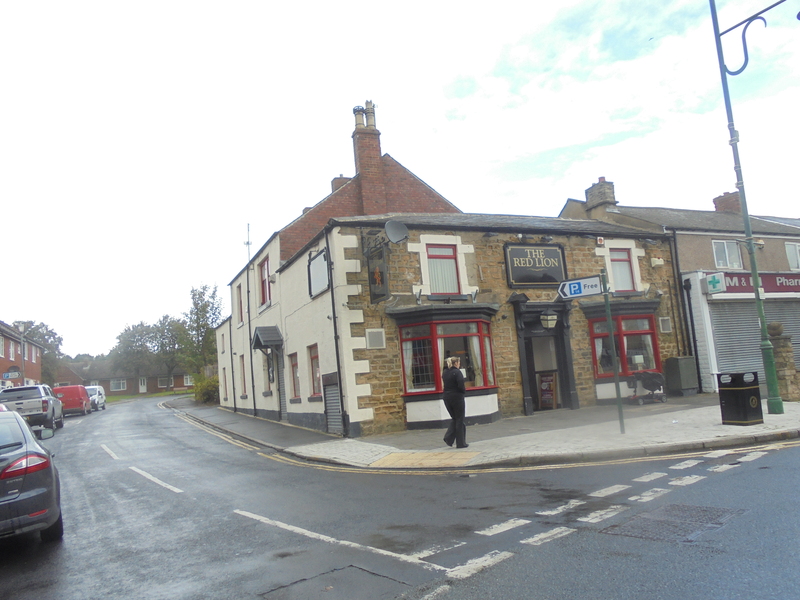 So, I was forced into a tour of Shildon’s pubs totally against my will. 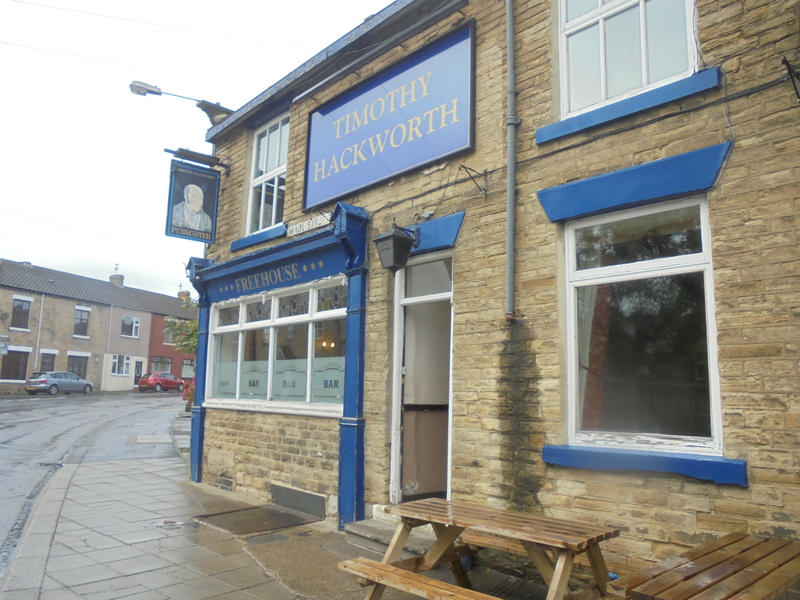 An incredulous Jonny asked “No pub visits today?” as I made a quick dip into the ground to secure an early programme (£2), but I confirmed there was no such departure from the norm and it was onwards to the main street (helpfully named Main St.) and to the first hostelry of the day, the Timothy Hackworth, named after the railway engineer who was the superintendent for the first locomotive on the Stockton and Darlington Railway. I plumped for a pint of Kronenbourg in here, but did feel somewhat out-of-place in a locals’ pub, though that’s not to say it isn’t a nice little place. Anyway, I finished it up and headed back uphill to the town centre. With a wedding just getting started in the church, the nearby Red Lion would provide my next altar (bar). A pint of Strongbow in here as one guy quoted Forrest Gump’s “Life is a box of chocolates” monologue in a decent impression was enough before I got lost looking for my next stop, the Three Tuns, despite it being pretty much opposite. Classic stuff. The Three Tuns was probably my favoured pub of those I visited, with it having the lesser-spotted Woodpecker cider on draught too. 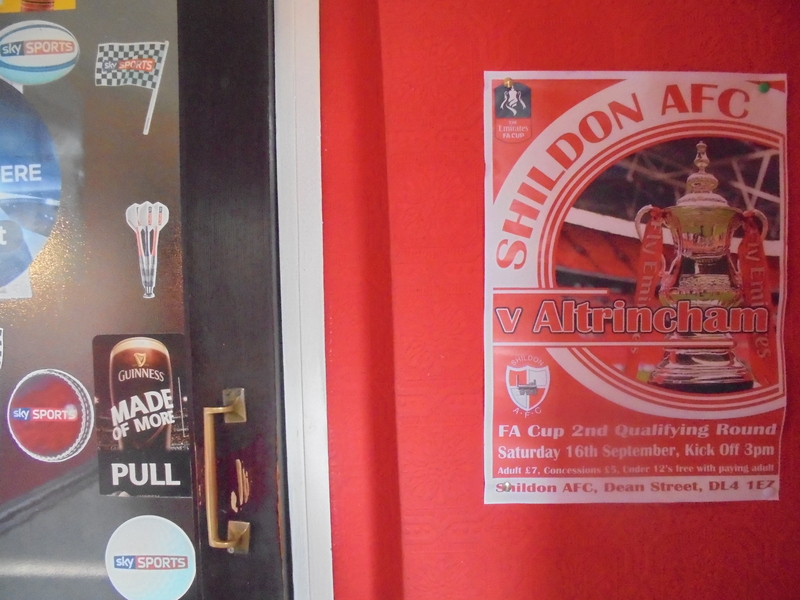 It also was proudly displaying the match-day poster alongside the door into the pub, which is always good to see. There wasn’t a whole lot going on in here really, though the circa-1990’s corded phone in the corner was a nice throwback! Soon enough, though, the time was moving onwards towards that magic 3pm stroke and so my intention was to move on back past the church and visit the nearby Royal George (this name also derives from the railway, named after an early train). 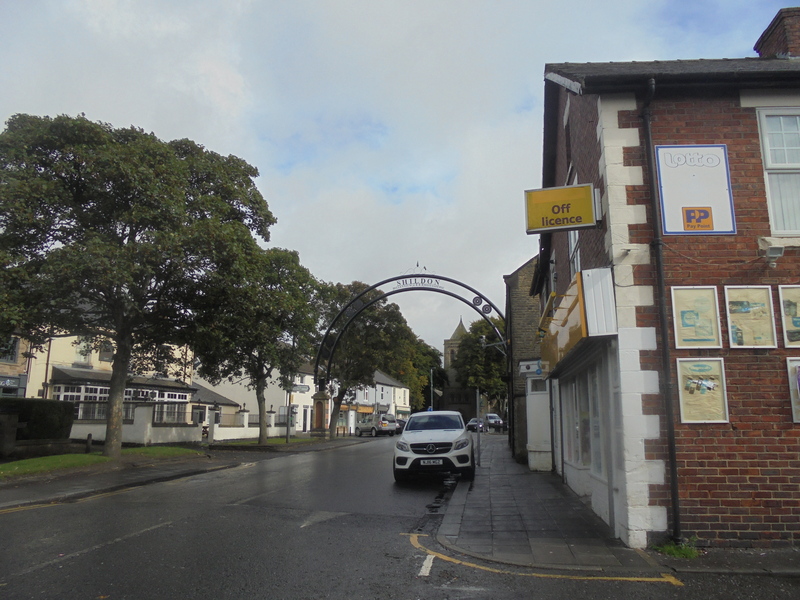 Sadly this was shut, but standing pretty much opposite was the Shildon Working Men’s Club. Any potential entry issues were soon allayed with a blackboard outside the door displaying “Altrincham fans welcome” and so I reckoned to miss it out would be rude. After being talked off the “slow pouring” Woodpecker in here, I instead went for a Mixed Fruits Kopparberg as something of a refresher. Soon after, as I was sitting in and minding my own business, I was asked by the guy behind the bar if I was an away fan. “Sort of!” I replied, before the response came “Well, that’s two of you then, good job we didn’t get extra staff in. We were expecting more.” That sounded a real shame, but at least the slight bit of extra custom wasn’t wasted on an extra pair of hands! Anyway, it was time for football! 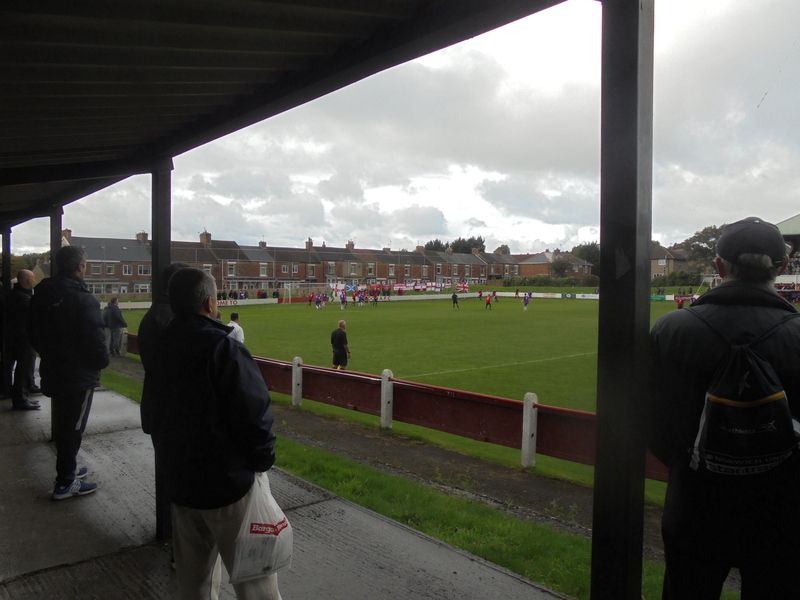 Shildon A.F.C. traces its roots back to 1890 and Shildon Town. This club joined the Auckland & District League two years later and, in 1894, the club merged with the finely named Rangers & Heroes F.C. to become Shildon United prior to folding in 1900 when playing in the Northern League’s Division 2, along with the division as a whole. 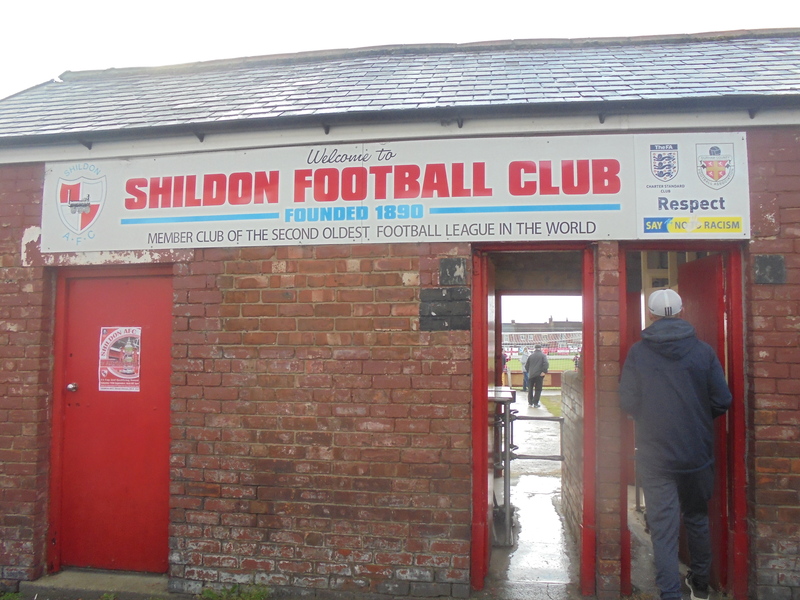 A re-formed club began life in 1903, taking a place in the Northern League once more and took on the moniker of Shildon Athletic. 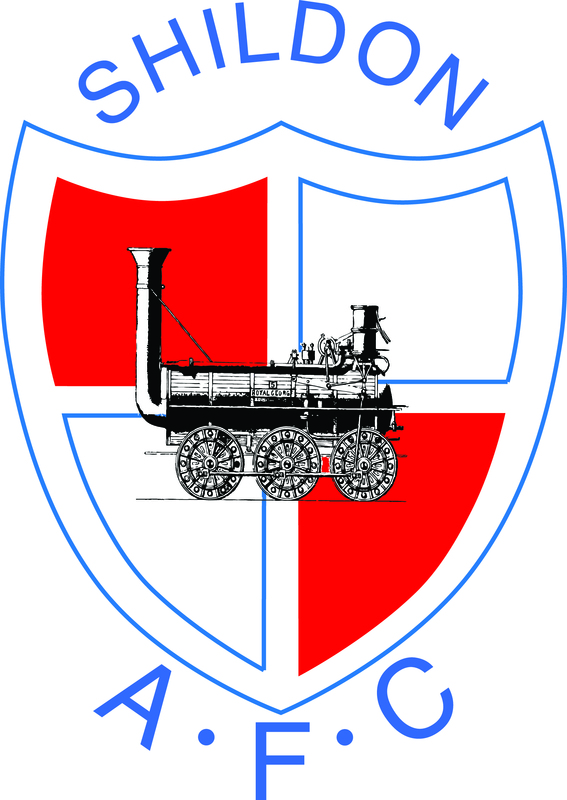 This club later joined the semi-pro ranks and the North Eastern League in 1907, prior to taking on the name of Shildon A.F.C. in 1923. 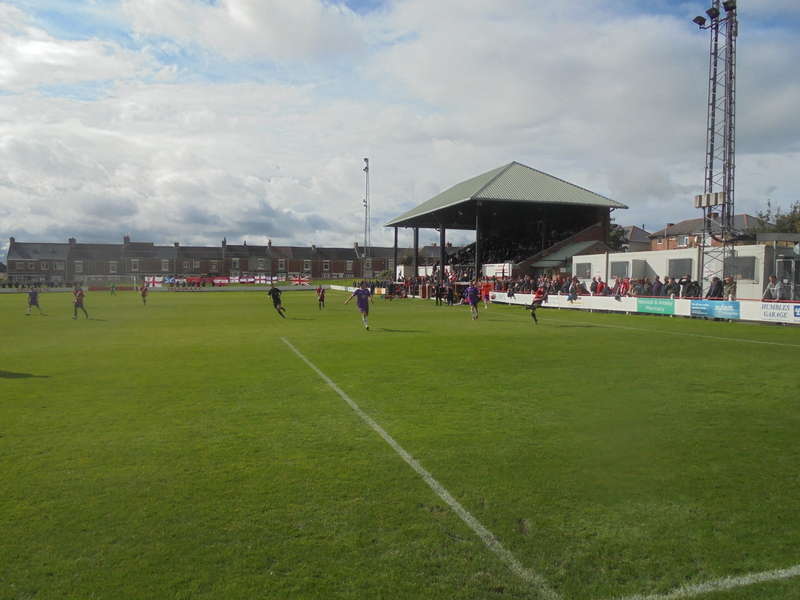 Here, the club would record a best finish of second place in 1933 and be promoted back to the Northern League (along with reaching the First Round of the Cup for the first time in 1927), which the club would go on to win four times consecutively (between 1934 & ’37) in the lead up to World War II. 1937 also saw the club reach the Second Round of the FA Cup, prior to their penultimate Northern League triumph in 1940 before war affected the game. 1985 would see Shildon eventually relegated in 1985 to end their stay in the top division of the Northern League, but their stay in the second division would last just two seasons, as the club were promoted back. However, this began something of a yo-yo existence for Shildon, as the club would go on to be relegated in 1992 for just the one season and again in 1999 for three further seasons. The Railwaymen would go on to win the Northern League’s Second Division in 2002 and lift the league’s Challenge Cup the following year. 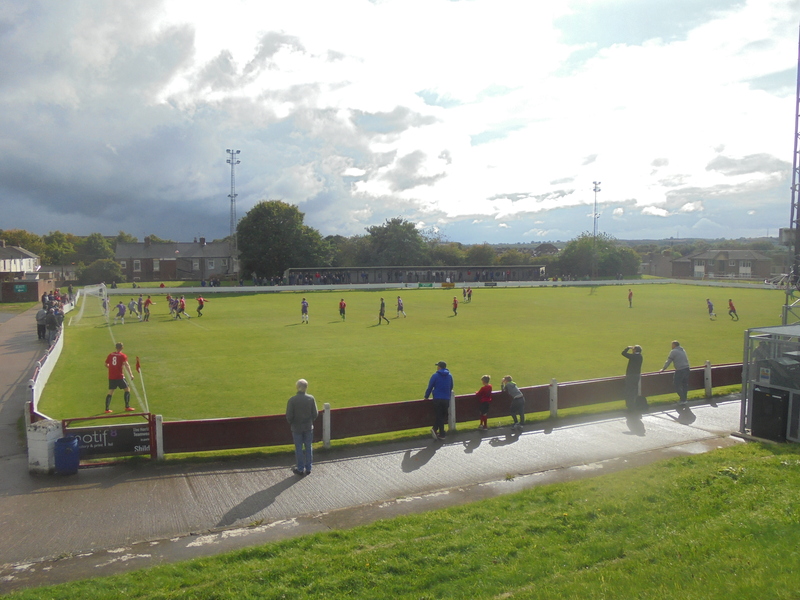 After surviving financial issues in 2004, the club avoided relegation and rebuilt into a solid outfit, ending up as Northern League runners-up in 2010 and missing out on a Wembley trip after losing in the 2013 FA Vase semi-finals. 2014 saw the club lift the Durham Challenge Cup for the first time and this was successfully defended the following season, along with a further runners-up placing, before they’d finally end a 76-year wait for a title with the 2016 Northern League. Last season saw the Railwaymen end up in 4th place. 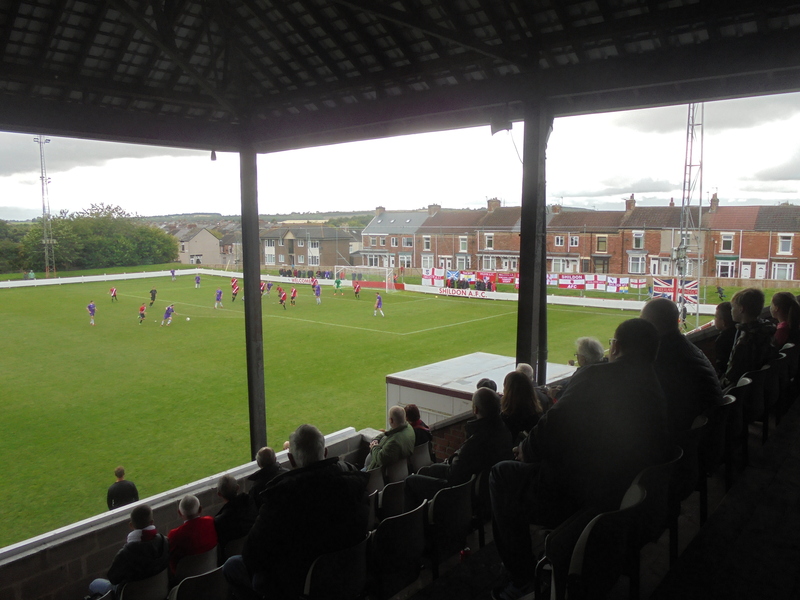 The players soon made their entrance to the field and we were underway in the FA Cup 2nd Qualifying Round. With chips in hand (£1.50 for a small-ish portion), I watched the initial stages of the tight contest from alongside the stand, leaving moving into it for the second half. Of course, first came the obligatory lap. Very little in the way of action was to occur during the first half, however, with neither side looking to give anything away too early. 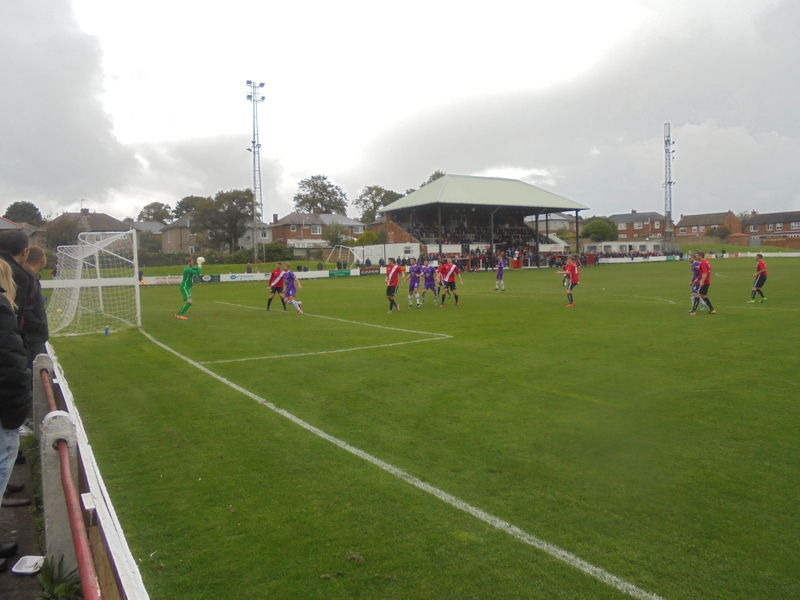 For what chances there were, Altrincham had the better of them their best chances seeing a shot saved by the home ‘keeper and the alliteratively named John Johnston’s shot flying across goal, but wide. Shildon responded with ex-NPL era Durham City man Billy Greulich-Smith seeing his effort kept out by Robins gloveman, the just as alliteratively named Tony Thompson. As I arrived in the stand for the closing stages of the half, the rain began to come down to give a summary of what we’d just seen. Half-Time, nil-nil and little to get excited about. My mood wasn’t helped by the bustling clubhouse meaning I decided to spurn a visit, despite a glowing recommendation from “Mr Nobody”. The half-time period did alert me to the attendance of Shrewsbury fan and groundhopper Lee, who’d undertaken the long journey up during the morning. After finding the “pie-juggling” Lee (as he described himself), the second half had gotten underway already. 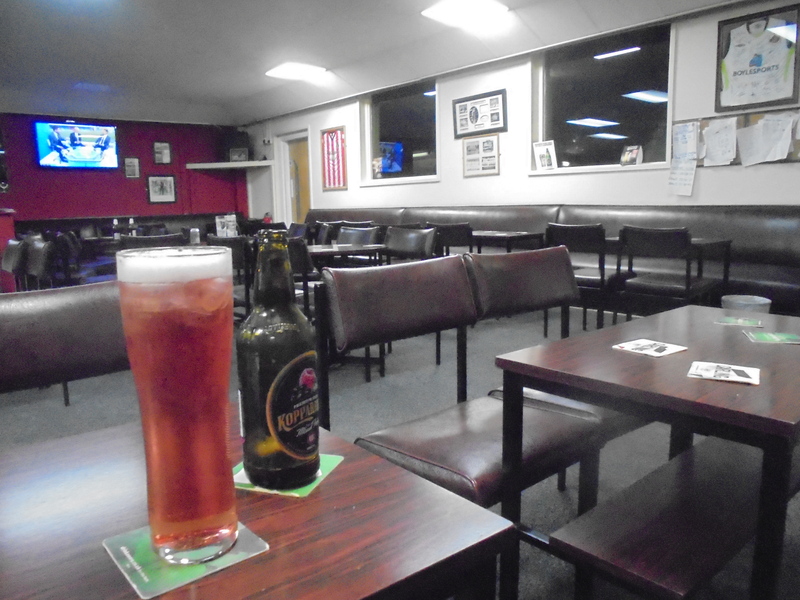 As the action failed to improved markedly, talking points turned instead to the previous round and my visit to a local club of Lee’s, Haughmond FC, who did their own “giant-killing” in taking out Matlock and forced Boston United to a replay, which they ultimately were to lose. Lee was also disappointed he’d missed out on the Flying Scotsman, which isn’t doing much for the image of us groundhoppers! With little of note occurring outside of an Alty free-kick rippling the side netting, it was a massive shock to the system when the ball ended up in the net after 70 minutes, but the home side’s celebrations were cut short by the referee’s whistle. A foul on Thompson was the reason for the “goal” being chalked off, much to the chagrin of those around us. It looked as though the game was meandering to a replay, as Lee and I began to come to terms that a nil-nil was about to occur. But then, drama as stoppage time arrived. Shildon advanced down the left and into the area. James Jones lost his footing and handled the ball and despite the Shildon man going on and firing wide the referee, quite rightly, pulled play back for the spot-kick. Jones was given his marching orders and up stepped Greulich-Smith to take the kick. However, it looked as though Thompson had come to the rescue of his side as he beat away the poorly placed pen, only for the rebound to fall onto the head of sub Cameron Fenton and he judged his looping header to perfection, the ball drifting into the far corner to spark scenes of jubilation from three sides of the ground. The Altrincham fans were left dismayed and staring an upset in the face. Blurred, but that’s the winner! After what must have seemed a lifetime, the referee blew for Full-Time to signal Shildon’s passage into the Third Round of qualifying. Altrincham, meanwhile, now have to settle on the Trophy for FA competition success. 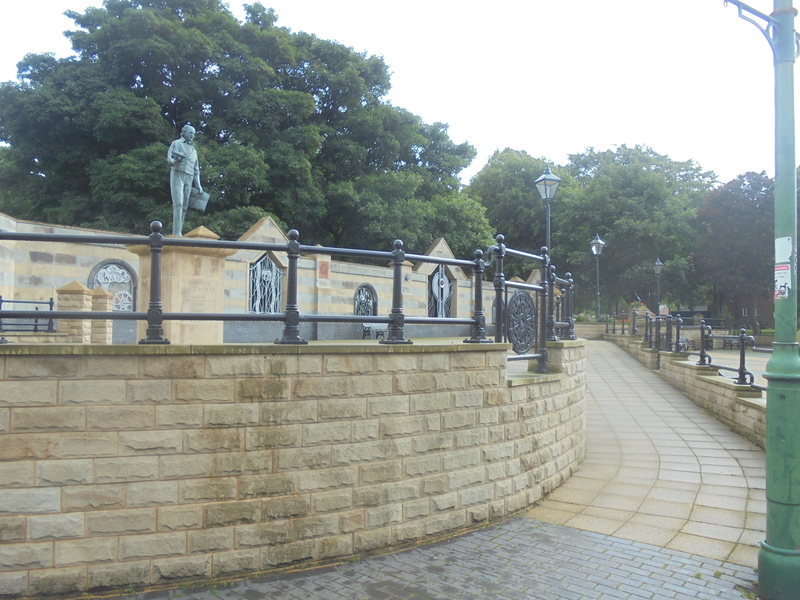 After bidding goodbye to Lee, a long, uneventful journey back was had while the coach driver kindly dropped me off as far towards the Volunteer pub in Sale as she could. With an hour to wait until my bus back, a pint of Holt’s Crystal Gold was enjoyed before the final stage of the trip was completed. So, there ends another round of the Cup and another upset! 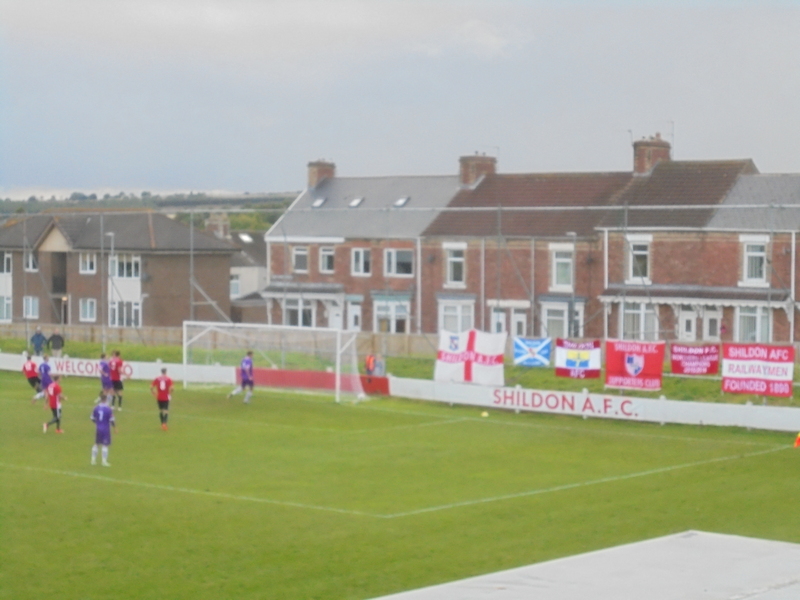 Shildon definitely deserved their win, having competed pretty comfortably with Altrincham throughout. They remained solid and took their chance (eventually) when it arrived. 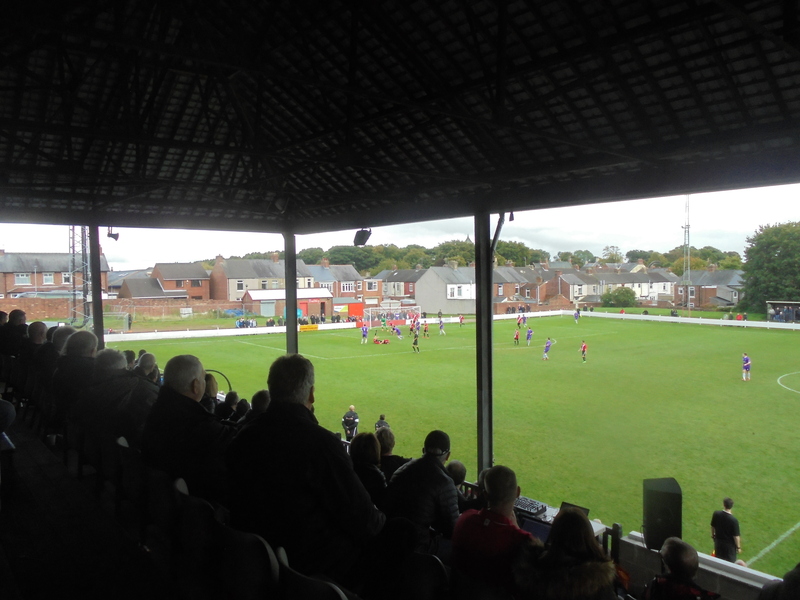 Altrincham, however, just didn’t really look up for it from the off and showed the levels they can reach the Tuesday after in dispatching Farsley Celtic for six. But, it was the Railwaymen who have the money in their pockets and with a trip to Banbury of all places in the next round, they definitely need it! As for me, it looks like a trip over the border for next week. Cymru awaits….